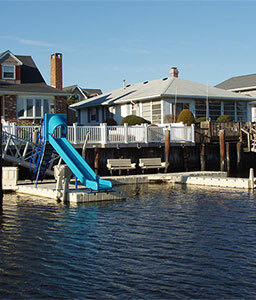 EZ Dock provides a variety of docks for housing developments as well as walkways, lift systems and other components which can help your residents enjoy the water more. At the same time, EZ Dock offers great value for the owners of the property. 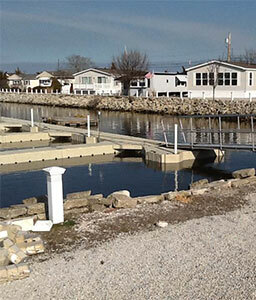 EZ Dock docks make waterfront living great for the residents of your community. Not only is this a terrific investment that will last for years, but EZ Dock docks are also virtually maintenance-free. They will never need painting the way a traditional wooden dock will and will never rot or splinter. In fact, you can walk on EZ Dock docks and gangways and never have to worry about getting a splinter. If you never want worry about falling through or compromising structural integrity, you’ll be pleased to know that EZ Docks have outstanding load capacity thanks to optimal-strength-designed floatation chambers. What does this mean for your housing community? For residents, it means more time spent on the water fully enjoying the area near their home. For you, it means an investment that can help attract more residents and can create more of a community feel. 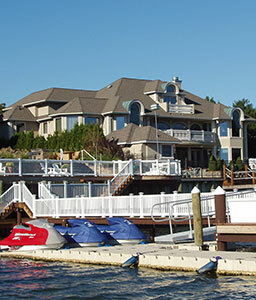 Since EZ Docks are durable and low-maintenance, they will not cost much in upkeep and keep providing benefits for years. EZ Dock also offers many options for your housing development. Set up a fishing dock so your community can fish or easily install an EZ Dock system with individual sections which allow you to build a dock for swimming, boating and other applications. The EZ Kayak Launch is another great solution. It’s inclusive and accessible, allowing community members to use their own kayaks or canoes in the water. It is even accessible for seniors, children and those with disabilities. Of course, the EZ Dock team would also be pleased to discuss custom solutions for your community to build a system that works for your unique needs. EZ Dock is a leader in floating modular docks. Just about every competitor has tried to copy EZ Dock docks — especially our PWC Port, the Port Max 2i, which is considered the leader in the industry. But there’s only one EZ Dock. You won’t find our high load capacity, attractive design, customizable structures, exceptional customer service, maintenance-free docks and splinter-free design anywhere else. We’ve been in business since 1991 — we’re not only the pioneer in floating docks, but we’re also the innovators and the name more businesses and homeowners trust for their dock systems and accessories. Curious to learn more? Contact us today!